Brian Lenihan confirms he’ll vote for Brian Cowen in today’s vote – all but assuring the Taoiseach’s success in today’s vote. Brian Cowen was leading a meeting of the Cabinet this morning ahead of this evening's vote on his leadership of Fianna Fáil. 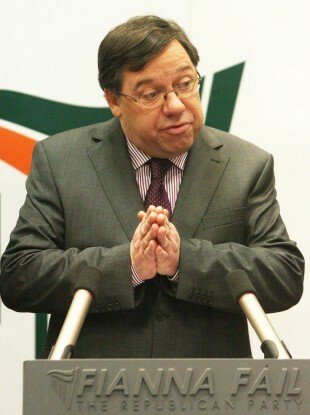 BRIAN COWEN this morning lead what could potentially be his last Cabinet meeting, ahead of this evening’s critical vote on whether he will remain leader of the Fianna Fáil party. The Cabinet assembled in Government Buildings on Merrion Street this morning for its usual weekly pre-Dáil meeting, ahead of what is likely to be a tense session of Leader’s Questions in the Dáil – and then the crucial meeting of the Fianna Fáil parliamentary party, where Cowen will propose a vote of confidence in himself. That vote, if Cowen loses it, will force him to resign as the leader of Fianna Fáil – though with members of Cowen’s front benches slowly coming out of the woodwork to support him today, the Taoiseach seems set to carry the day. Cowen’s chances were given a major boost this lunchtime with the confirmation from finance minister Brian Lenihan that he would be supporting Cowen in the vote, telling RTÉ’s News at One that “the interests of the country required stable political leadership” and that only the status quo would maintain that. Last night, retiring Transport minister Noel Dempsey took the opportunity of the nomination convention in his Meath West constituency to also back Cowen; The Irish Times estimated that the latest declarations of support for Cowen brought his support to 35 TDs – just one short of a majority, with voting in this afternoon’s meeting restricted to the party’s 71TDs, though the party’s 24 senators and three MEPs may also attend. Among those 35 is former minister Mary O’Rourke said she was voting confidence in Brian Cowen “without any great enthusiasm”, explaining that the move was “too late” in advance of a general election. This evening’s vote will be conducted by secret ballot, however, meaning that Cowen’s fate cannot be guaranteed until the final outcome of the vote is revealed. Dáil business kicks off at 2:30pm today, with Taoiseach’s Questions timetabled for 4:15pm, where Cowen is likely to face further ire from opposition leaders. The crucial Fianna Fáil meeting begins at 5:30pm, with a result on Cowen’s fate not expected before at least 7pm. Email “Cowen set for victory after Lenihan shows hand”. Feedback on “Cowen set for victory after Lenihan shows hand”.